It’s the small things you miss when you’re away from home — things like a Sunday lamb roast. Cambodians don’t cook in ovens. Everything is done barbecued, stewed, steamed or fried. It’s fast-cooked in woks, simmered for a while in large saucepans or char-grilled over coals. The vast majority still cook in outdoor kitchens. 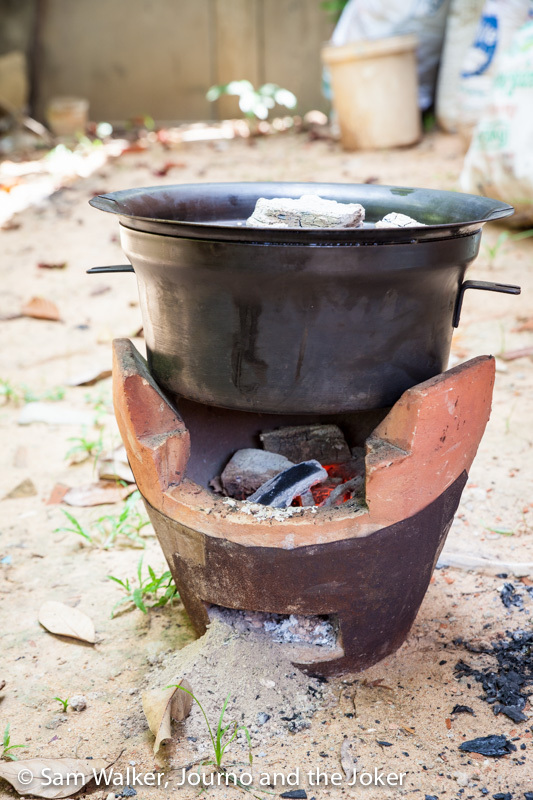 While some use gas burners, many use charcoal burners, usually in a terracotta stoves. And they usually buy small quantities of meat, which are much cheaper rather than 2kg cuts. So, not surprisingly roast meat (or vegetables) is just not a thing here. But the Joker was getting a hankering for a lamb roast and when we found frozen lamb in the supermarket he was nearly drooling. But how to cook it? That problem was solved when my parents visited in August and we asked them to bring a camp oven with them. A camp oven is usually cast iron and a bit like an outdoor version of a Dutch oven. They are popular with campers in Australia and are used to cook a huge variety of meals over the coals of a campfire. If you haven’t had a camp oven roast you are really missing out. 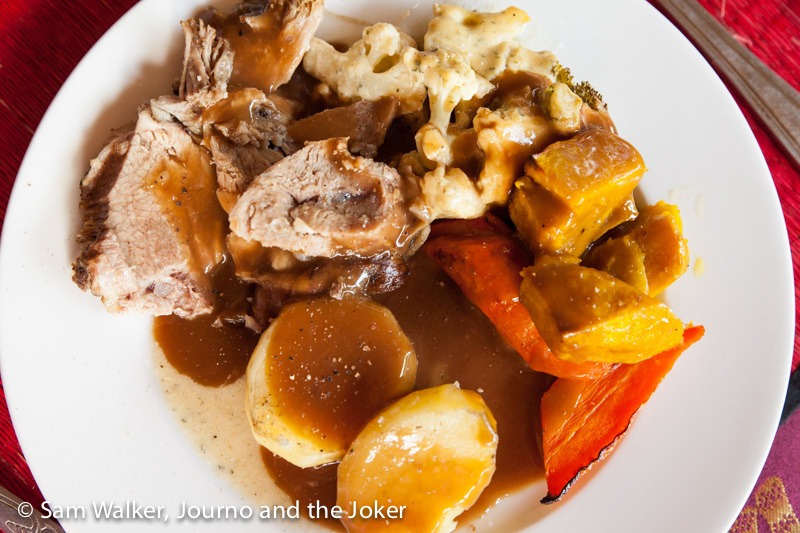 This camp oven is steel, so it heats differently and we had to experiment — but the Joker finally got his lamb roast. In fact, he’s had two. The first one we cooked for Khmer friends, who had never eaten lamb. We threw in a heap of veggies and kept it simple so they could really taste the flavour of the meat. It was a bit of trial and error. We used cheap oil because we forgot to take some with us, which burnt and smelt awful and I feared it was going to ruin the meat. Fortunately, it didn’t. And they must have thought we’d never cooked with coals before so the girls were very helpfully trying to prepare the coals and kept adding more, so it started off a little hotter than it should have been and burnt the outside of the meat. But it was a 2kg roast and only a small portion was burnt. We forgot the gravy so we used the popular Khmer pepper sauce — a tangy sauce made with limes, salt, sugar and pepper — which worked really well with the lamb. The second time was with a group of friends. 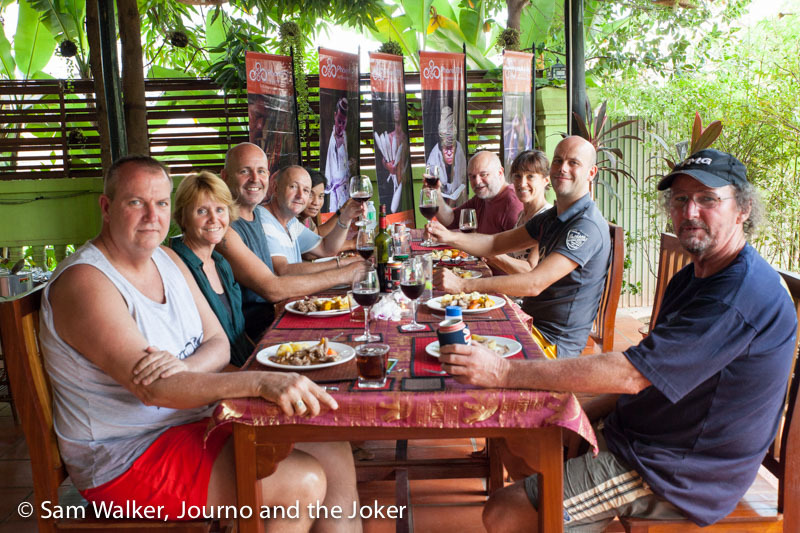 Thanks to Paul and Keith at the Golden Gecko Villa we were able to use their property and Mr Joy’s terracotta stove to cook it. We found these terracotta stoves work really well as the pot is not sitting directly on the coals and it is easy to add more charcoal or pull some out and control the heat. The second one took about three hours. We did this one during Pchum Ben, when nearly everything in town was closed — including most of the market stalls. It meant we couldn’t find a few things, like rosemary and only one small head of broccoli but as always in Cambodia, you make do with what you have. And this time we did have gravy. For us, a camp oven is something we relate to camping and therefore is a pretty casual affair. But Keith and Paul had different ideas. While we were cooking the meat and Keith was slaving in the kitchen preparing roast vegetables in the small bench top electric oven, tables were set up, candles were lit, orchids were picked and our casual meal was turned into a fancy Sunday afternoon roast lunch. Wine was poured, glasses clinked and everything went quiet. Everyone was savouring the rare opportunity to enjoy a roast meal. Even Mr Joy joined us and had second, and possibly third helpings. It was the first time he had tried lamb and it was clearly a winner for him. It really is the small things in life that give the greatest pleasures. And food is one of those things. When you are away from home for a long time you do miss certain foods and a good roast meal is one of those meals. Thanks to Keith and Paul for the use of their property to cook this meal and to all those who shared their company with us. We’ll have to do it again soon. So, the camp over is just basically a big pot but cast iron? Could you try doing the same thing with pots of other metals? I know that the cast iron would work better, but just wondering if you’ve ever tried using anything else. Yes, usually a camp oven is cast iron. But this one is actually steel. It doesn’t work quite as well as the cast iron but it does work. Cast iron holds the heat better I believe. Due to the length of time it is on the heat I think the steel needs to be fairly thick. You need the heat to be trapped in a bit like an oven works. It looks almost exactly like the pot my in laws use in rural Philippines. I’m pretty sure my husband would kill for a cast iron camp oven! Haha. They are awesome. Things taste really good in them. You can cook all sorts of things in them from roasts to desserts and some bread to casseroles and stews. If you do a google search you’ll get more info about them and perhaps someone more knowledgable will know if you can use alternatives.